Activision unleashed its live-action trailer for Call of Duty: Black Ops 3 today. And it's a typically impressive production from 72andSunny—a documentary-style look at a world decades from now in which humans have used technology to fully optimize our physical selves (including weaponizing our very bodies) but are starting to lose our souls in the process. There are some notable differences, though, from past Call of Duty campaigns. First off, there's no celebrity anchoring the proceedings. This is somewhat rare. Past Black Ops ads have featured Jimmy Kimmel, Kobe Bryant and Oliver North. And the larger Call of Duty advertising canon has starred everyone from Megan Fox and Jonah Hill to Robert Downey Jr. and, last year, Kevin Spacey. But perhaps even more notably, Activision fell in love this time with a new platform—Snapchat—to rile up Black Ops fans and get them to contribute to the marketing of the game they love, leading up to this new trailer. Now, let's step back and look at the Snapchat campaign from early April, developed by Edelman Digital and AKQA along with game developer Treyarch. 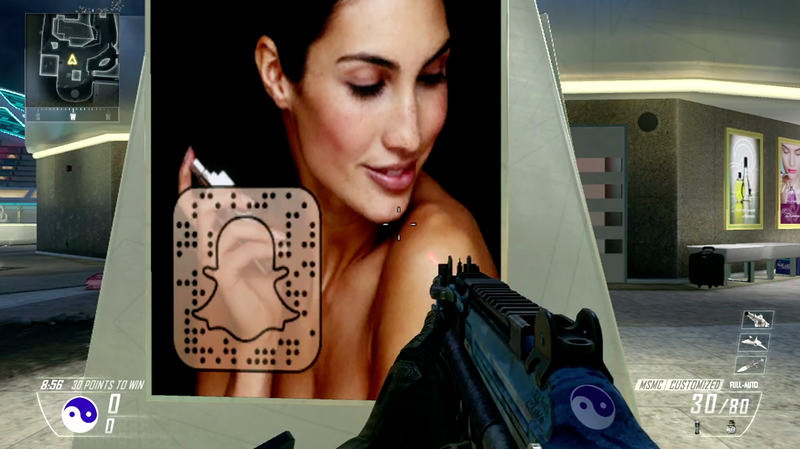 The campaign involved going into the software and updating the maps for Black Ops 2, which was released two years ago, to hide the Snapchat ghost symbol in various places in those worlds. Black Ops 2 players immediately noticed the software update, of course, and within a matter of hours they began to find the Snapcodes—which opened short, distressing video clips. The meaning of the clips was never explained, and they didn't mention Black Ops 3—but the gamers quickly began speculating about whether they were indeed a teaser for just that. This is the first time Activision has planted Easter eggs in an existing game to tease an upcoming game. And Tim Ellis, chief marketing officer at Activision, tells Adweek that Snapchat was an almost perfect vehicle through which to do that, particularly for this title. "It's a game that is all about being cryptic, secretive and morally ambiguous. And the way in which we revealed this speaks to those qualities," he said. "We all know Snapchat is the fastest-growing app in the social space. It's also one of the dark socials. For a game that's all about covert, dark, non-traceable, cryptic messages, Snapchat was a great fit tonally. It's a great marriage of media and message." It didn't hurt, of course, that Snapchat's main demo—like Call of Duty's—is young males, and that Snapchat delivers roughly 200 million monthly average users. No money changed hands. Unlike some paid Snapchat campaigns, this one was completely organic. And the results were impressive. Activision has increased its Snapchat follower count by more than 300,000 since the teaser campaign kicked off. "We were gaining two followers per second on day one," says Ellis. A few days after the Snapchat campaign broke, Activision confirmed Black Ops 3 with the official teaser trailer (see below), all of which set the stage for the live-action piece. The campaign continues this Sunday with the big unveiling of the gameplay trailer, created by Ant Farm. As a whole, the campaign clearly turns the marketing process into a game itself for the audience, serving as an homage to hard-core fans while also using them to keep the franchise growing. "With a young male player base, it's always important for us to be progressive and use surprise and delight tactics whenever possible, says Ellis. As for the lack of celebrities, well, maybe that will change as the expected late-2015 release date for the game gets closer. Says Ellis: "You can be sure there will be lots more surprises along the way." UPDATE: And here is the gameplay trailer.